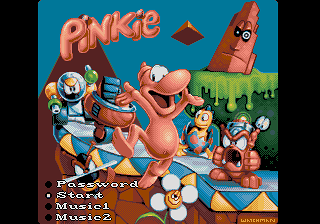 Pinkie was an unreleased port of an Amiga game of the same name. Thanks to Unseen64 for the original release. 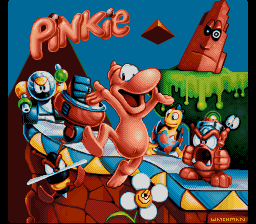 Pinkie was a game in development in 1995, and its likely demise was probably the decline of the SNES system itself. 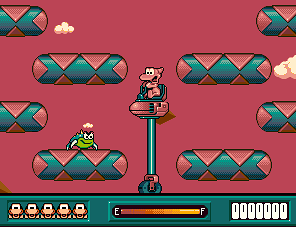 The Amiga version of this game came out a bit earlier in 1994. I gave it a try, and I have to be honest, it is an exercise in frustration. It is not actually possible to beat the first level the first time you go into it. You have to collect a bunch of flowers for points, then go into the base and purchase the items required to beat the level. The level designs also leave a lot to be desired, and it is not entirely clear what the goal is when you first play. What makes it even more tedious is that if you die in a level, you lose all your items, meaning you may have to collect the flowers all over again. 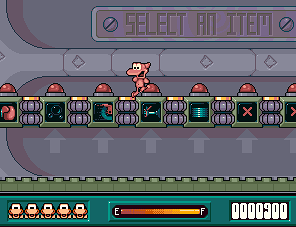 The game would be much more tolerable if you had all the power ups all the time. 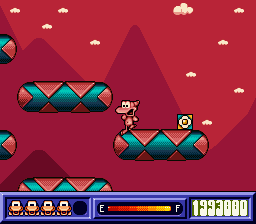 A prototype binary of the PAL SNES game was released by Unseen64 in August 2014. I'd assume they got this directly from the developers, but they didn't state that (merely stating that the person was anonymous). 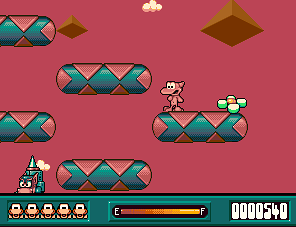 The file name "PINK2.ROM" is probably from a development build. The build is pretty close to completion, but a lot of debugging features are still on. The initial score is 200,000, which is enough to purchase any items that you might need. 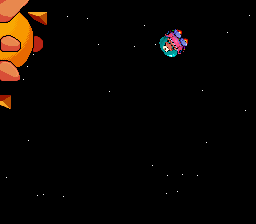 If you press select, you can fly around to wherever you want in the level. Pressing L will cause the game to enter a slow motion mode, though it is not clear if this was an intended debug feature since I couldn't figure out how to exit it. 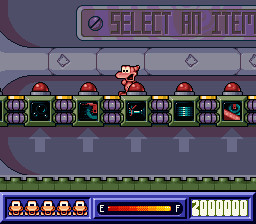 Pressing start will let you exit the level, in the Amiga version you have to go to a place where there is a down arrow and press "down". Finally, every level is accessible from the start, so there is no need to beat each level. 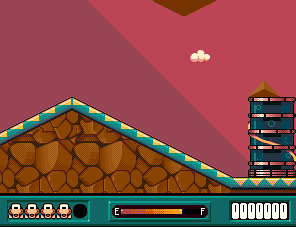 There are several differences from the Amiga game. 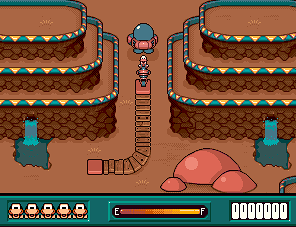 The controls are notably looser than the Amiga version, though is helped by having more buttons at their disposal, making it easier to do things like exiting the rover. The loose controls make platforming a very frustrating experience. The graphics on a lot of sprites, such as the flower points icon are different. The teleporter when you enter a level is much different. 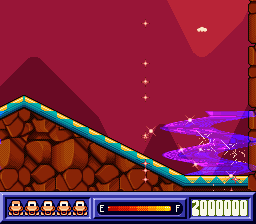 In the Amiga version, it is an opaque machine, while in the SNES version it is a translucent wavy effect. 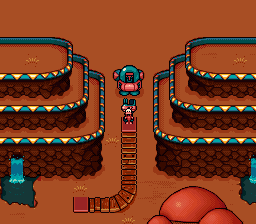 The Amiga version starts you off in your rover, in the SNES version you either have to explicitly climb into it on the map, or go to the base at the start of the map. 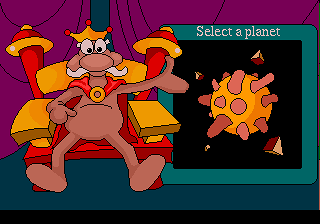 The Amiga version has one hit kills, and sends you back to the map once this happens. 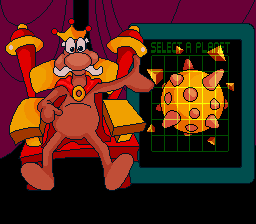 In the SNES version, the lives act as a health bar instead, but if you lose them all it is still game over. The graphics are very bare-bones, sort of what you would expect from a port of a computer game from that period. The music is quite nice and catchy. The sound effects, while there, are obviously not programmed correctly. Some actions, like springing the rover, output a seemingly random sound effect each time you do it. 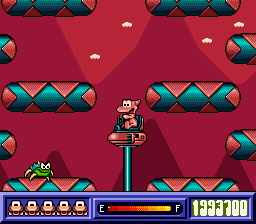 Pinkie does not have any sound effects programmed in the prototype, but in the Amiga version he makes sounds like panting. Honestly, if this game were finished and released, it would have been a tough sell in 1995, when there was competition from the likes of Donkey Kong Country and Yoshi's Island. It isn't really hard, just too frustrating to compete. Amiga SNES - the SNES has lower resolution, so the viewing area is less. The backgrounds have a different design.